Incorporated was a scanned image of a spiral notebook. I wanted to use it in the magazine spread but I think it worked better here. 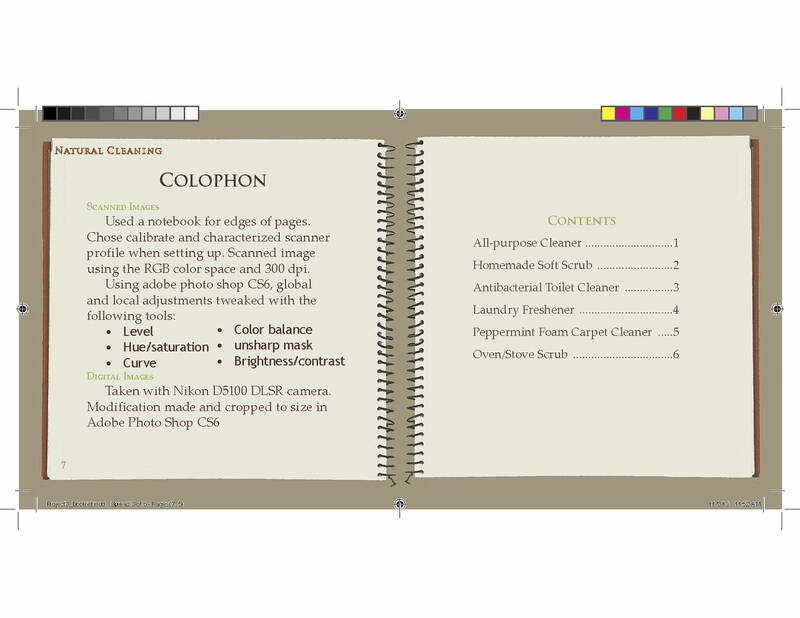 I grouped the image for the spreads and added a colored rectangle to the bleed. When printing to the postscript file the realization that the old table of contents was grouped within these two objects began apparent. The objects were accessed on the interior master page and ungrouped. Then, the old tale of contents was deleted and all the objects put back into place. 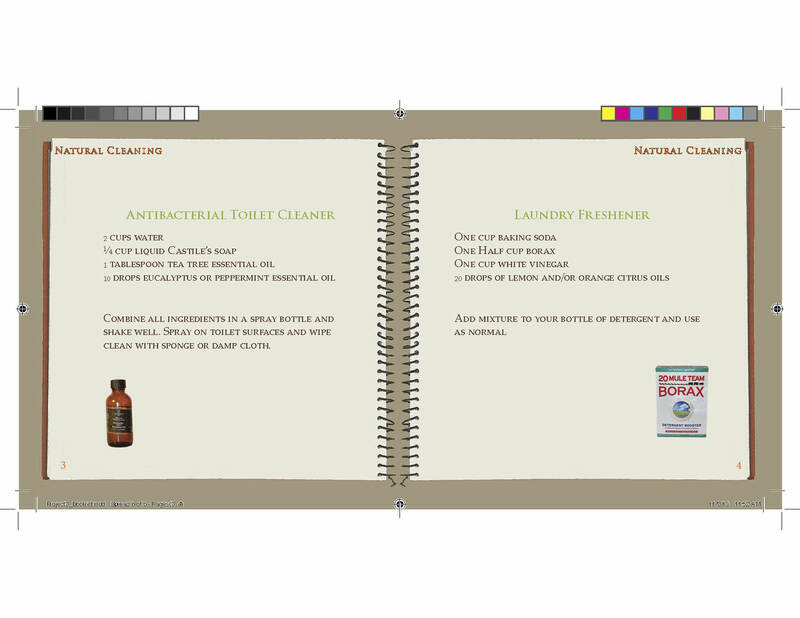 The booklet’s topic covered natural cleaning. 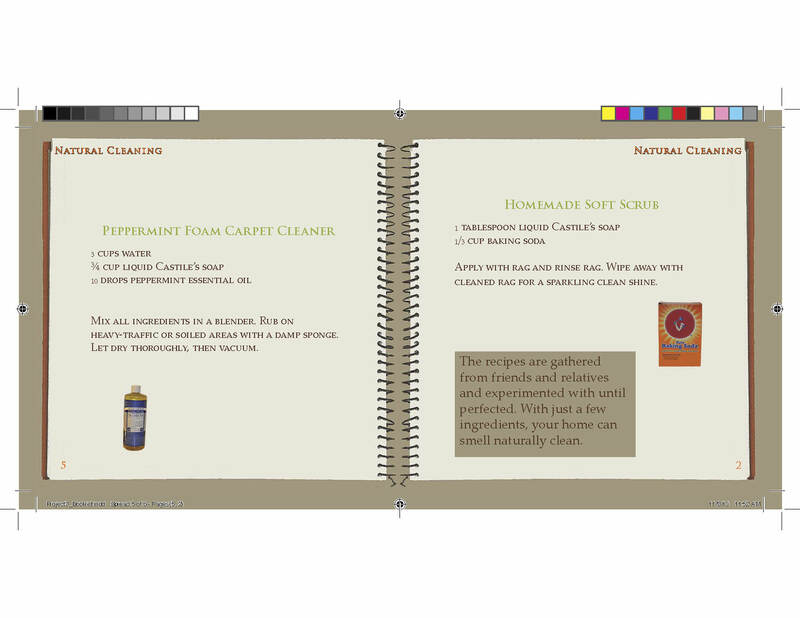 The format was a cook book, Six recipes were included with a table of contents. The storyline threaded to another page. Color was handling through the Swatch panel. I used the Kuler extension to pick a pallet. 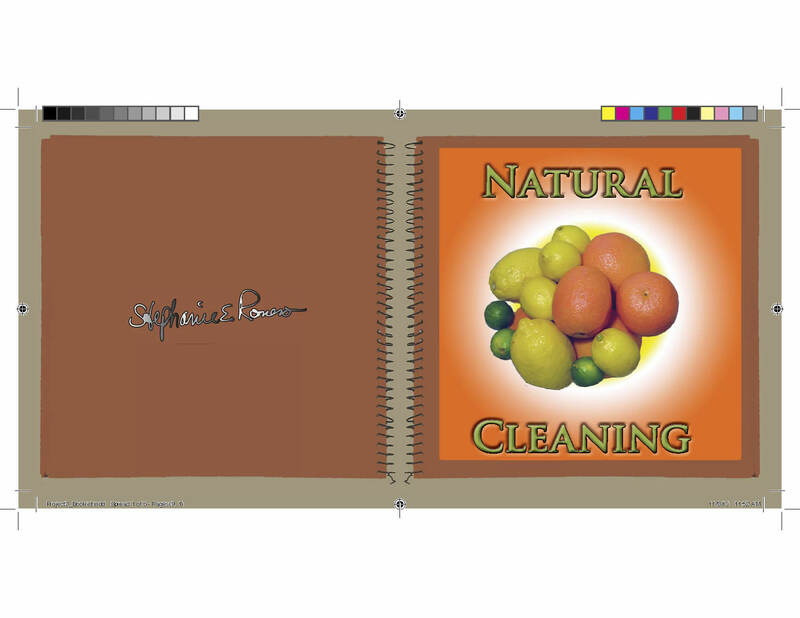 Other colors brought in from the images listed below and the border images. Spot and sampled colors were converts to process colors. I really enjoyed learning the page transition feature. I appreciate getting html to pop into any website. Taken with Nikon D5100 DLSR camera. Modification made and cropped to size in Adobe Photo Shop CS6. 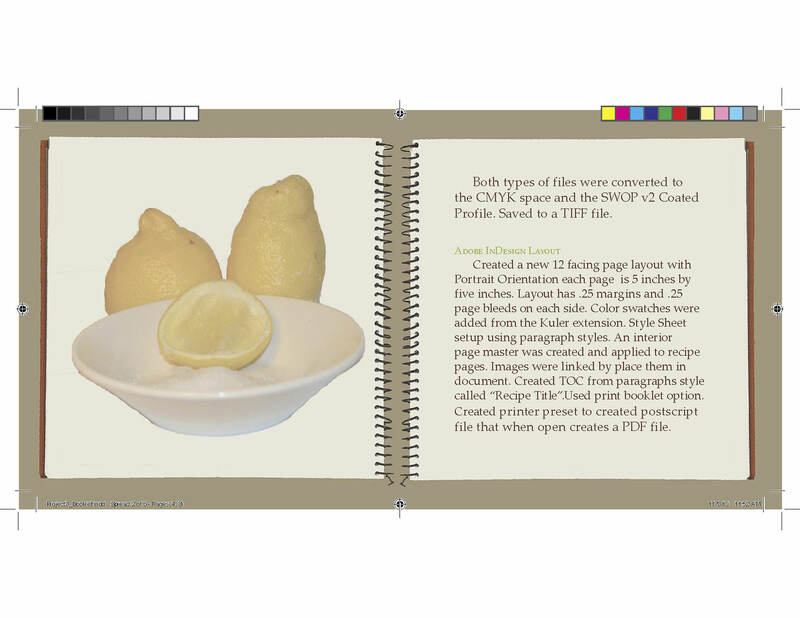 Both types of files were converted to the CMYK space and the SWOP v2 Coated Profile. Saved to a TIFF file. Created a new 12 facing page layout with Portrait Orientation each page is 5 inches by five inches. Layout has .25 margins and .25 page bleeds on each side. Color pallet created in Kuler extension. Style Sheet setup using paragraph styles. 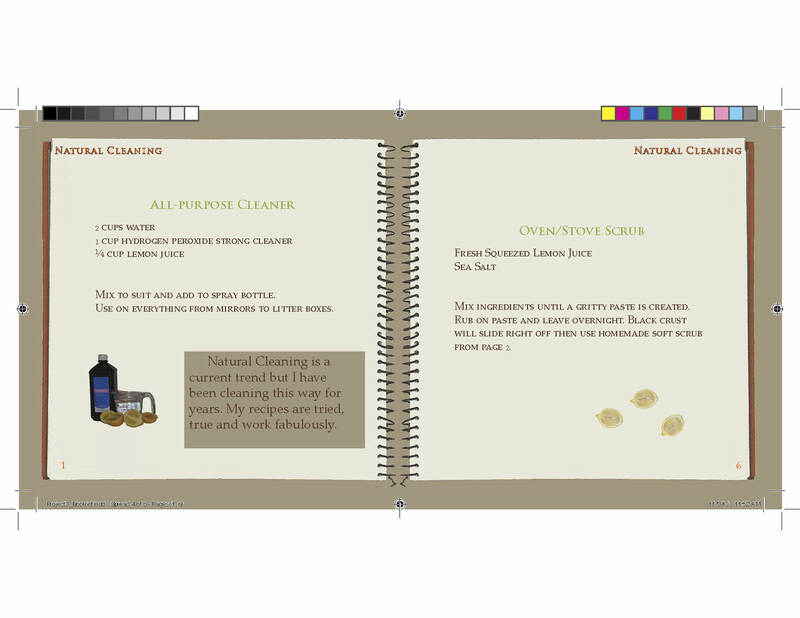 An interior page master was created and applied to recipe pages. By placing images in document, a link was created. Created TOC from paragraphs style called “Recipe Title”. Used print booklet option. Created printer preset to created postscript file that when open creates a PDF file.